In large bowl, stir together Bisquick mix, milk and eggs until well combined. Grease and heat griddle. To make lion pancakes: Ladle batter onto hot greased griddle, making 6 large circles for the heads and 6 smaller circles for the mouths. Cook on both sides until golden, about 5 minutes. Place 1 larger pancake on serving plate; top with smaller pancake. Decorate with sliced strawberries for mane and nose, blueberries for eyes and chocolate chips for mouth (see photo). To make caterpillar pancakes: Ladle tablespoonfuls of batter onto hot greased griddle, making small circles. Cook on both sides until golden, 3 to 5 minutes. Place circles on serving plates to look like caterpillar (see photo). Decorate with raisins for the eyes, orange rind for the antennae and chocolate chips for the feet. To make dog pancakes: Ladle batter onto hot greased griddle, making 6 larger oblong pancakes (for the heads), 6 small round pancakes (for the snouts) and 12 oval pancakes (for the ears). Cook on both sides until golden, about 5 minutes. Place 1 larger oblong pancake on serving plate; top with smaller pancake. Place oval pancakes on either side of larger pancake to make ears. Decorate with sliced strawberries for nose and tongue, blueberries for eyes and chocolate chips for mouth (see photo). Feel free to mix it up with what you use to decorate the faces--sprinkles, blackberries, whipped cream and frosting all work well, too. 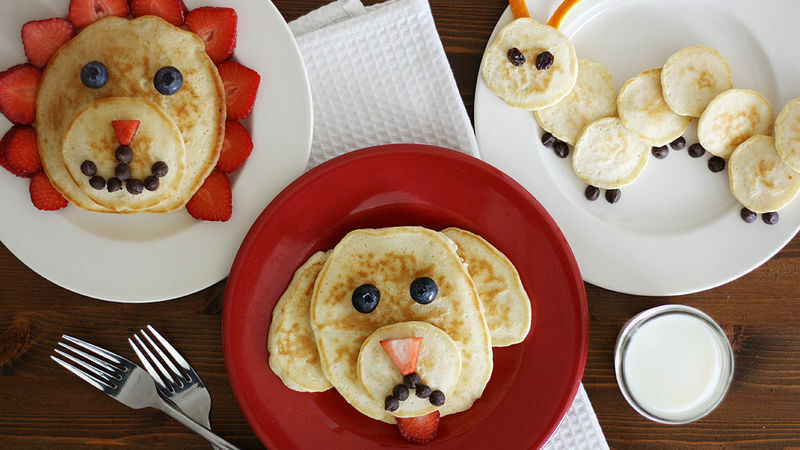 Have little ones help by decorating the animals once the pancakes are made. Add food colors to the pancake batter to make animals even more realistic.